Exclusive – McMAHON FAMILY SECRETS REVEALED! By our Investigative Reporter J.J.
Like Father. Like Daughter. Ward 32 Councilor Mary-Margaret McMahon has done an A-1 job for developers, all the while pretending to fight on behalf of Beachers who voted her in to office. There is a good reason why she is so successful at political intrigue. Her father is former Collingwood, Ontario Mayor Ronald Emo, who came out of retirement to help developers “amend” the Heritage District Plan of Collingwood. This is so that bulldozers and jackhammers can wipe the smile off the historic face of Collingwood. The former mayor has no qualms about demolishing Admiral Collingwood Place for developers. After all, this location, like the town, is only named after Vice-Admiral Lord Cuthbert Collingwood, the First Baron of Collingwood (1748-1810). Collingwood was second-in-command to Vice-Admiral 1st Viscount Horatio Nelson at the Battle of Trafalgar. He assumed command of the British Fleet after Nelson was shot and killed in 1805 at Cape Trafalgar, Spain. Former Mayor Ronald Emo couldn’t give two hoots about who the town was named after, or half-a-hoot about demolishing Admiral Collingwood Place. Like Father. Like Daughter. Meanwhile, back in our Beaches, Ronald Emo’s daughter Mary-Margaret McMahon (Ward 32, Beaches-East York) similarly shows no true regard for the past, present or future of our beloved neighborhood. Her so-called “Visioning” study successfully ‘blinded’ Beachers to the fact that the fix was in, and secretly favored mass development. Even the most educated citizens were duped by Councilor McMahon, as were the citizens of Collingwood. The apple doesn’t fall from the tree, and our research has uncovered numerous parallels between dad and his offspring, who is determined to turn our Queen Street East Miracle Mile into Condo Village. Which reminds us – the attempt by McMahon’s acolytes to change the name to Beaches Village is shameful and James Sears will have those offensive banners taken down immediately upon being elected to office. We will only have ourselves to blame should our neighborhood become an Erector Set of thousands upon thousands of crass condominiums. She’ll do it! Like Father. Like Daughter. THE CHAIR: Say anything you wish or you may go right to the questions by the members of the committee. MR. RONALD EMO: I stand before you as a candidate for my cross-appointment from the OMB (Ontario Municipal Board) to the ARB (Assessment Review Board). During the first two years of my time on the OMB we were the FINAL appeal board on assessments from the ARB. *** Those subscribers that have followed the condo onslaught are aware that the OMB is GOD in the development industry. They can bless your construction project or they can dash your development asunder. ***Now back to the vetting of Ronald Emo by committee members. MR. MIKE COLLE (Eglington-Lawrence): Mr. Emo, You were a partner in Oak-Lea Holdings Ltd., a Collingwood land development company. Could you give us some background? MR. RONALD EMO: It was a small situation. My survey partner, myself and a local lawyer bought some property in 1967 and we did different developments over the years. We have two one-acre industrial sites that we’re trying to get rid of to wind the company down. One experienced builder that we conducted a casual interview with said, “Yup, it sounds like municipal corruption to me. Developers like a ‘brown-envelope’ political environment. Everything is understood”. Meanwhile, back in our Beaches again, we face the most important vote ever. Rife with cronyism, nepotism, sweetheart deals, kick-backs and assorted quid pro quo, Mary-Margaret’s got to go!!! Post Script—Vice-Admirals Collingwood and Nelson are interred at St. Paul’s Cathedral. Post Post Script—October 27th is Election Day. With this new information, Mary-Margaret McMahon will surely be made to walk-the-plank by Beaches voters. LET’S MAKE HISTORY!!! This is to inform you that the post about Mary is misogynist, defamatory and harassing. “Her so-called “Visioning” study successfully ‘blinded’ Beachers to the fact that the fix was in, and secretly favored mass development.” – How does this favour mass development? 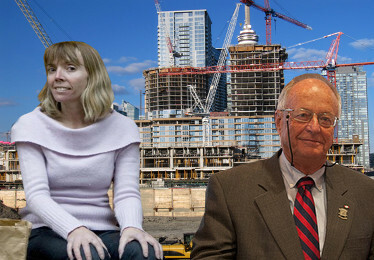 “The apple doesn’t fall from the tree, and our research has uncovered numerous parallels between dad and his offspring, who is determined to turn our Queen Street East Miracle Mile into Condo Village.” – Can you specify which condo developments Councilor McMahon supports and are being built along Queen St. E as a result of her support for mass development? “We will only have ourselves to blame should our neighborhood become an Erector Set of thousands upon thousands of crass condominiums.” – Where are the 1000’s of applications for condos in the east end? Where will they be going? Finally, what simple steps could be taken to prevent condo’s from being built in desirable neighborhoods (east end or otherwise) and how would you implement the changes to stop for-profit businesses from creating jobs and making profits by building and selling condos?